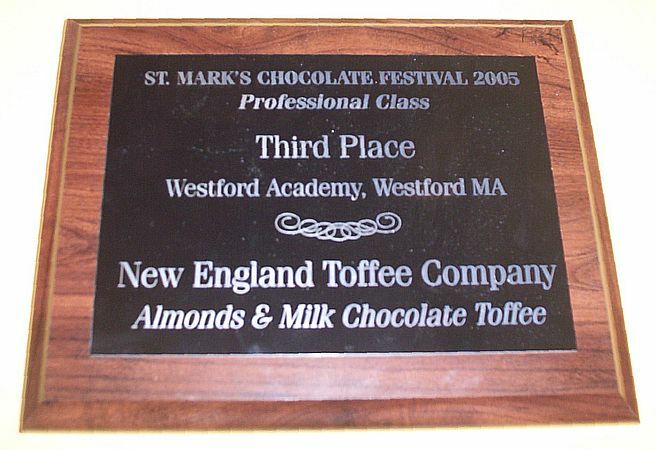 On February 6, 2005 our Almonds & Milk Chocolate Toffee was the 3rd place winner at the 15th annual Chocolate Festival in Westford, MA. We are very proud our our 3rd place award, as we competed against many chocolate desserts from well-known area restaurants. The first place winner was the Stagecoach Inn & Steakhouse in Groton, MA with a chocolate ganache frosted chocolate cake. The second place winner was the 99 Restaurant in Westford, MA with a midnight-fudge cake. With our official 3rd place win also came a verbal congratulations that we were unofficially the best candy there!